There are few things more satisfying than a bubbling pan full of hot freaking cheese. I mean come on. Look at that burned cheese photo shoot! That is not even fair! For those who haven't figured it out, this recipe is NOT for the faint of heart. My. Goodness. Chewy noodles covered in tomato sauce and rich ricotta- lasagna simply has to be one of the best things to ever happen to this Earth. And here is the beauty about this recipe- it looks like it took a whoooole lot of work and talent. The secret is, friends, that is takes a whole lot of NEITHER. 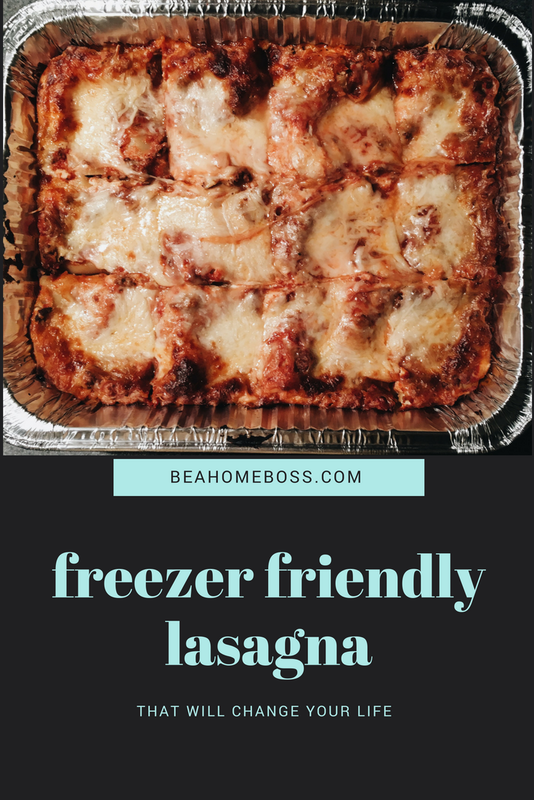 There are about 384 reasons I love this lasagna recipe but the biggest one is that it is freezer friendly! Since it can be frozen and stored for months, I always make two pans when I make my lasagna. My theory with all things prep is simple- why make one when you can make two? You have already gathered the ingredients, done the prep work, and dirtied all of the dishes! Make a couple batches while you are at it, and save yourself oodles of time in the future. Okay, lets begin with the cast of characters. The sauce. The sauce makes or breaks the dish. You have some options. Grab 3ish jars of marinara from the store. Add some beef/turkey/sausage to it and bam- spaghetti sauce. You can also save a few bucks and make your own! I have a fantastic recipe that requires little to no effort and is extremely difficult to mess up. If that doesn't sell you on it- it is also damn delicious. Similarly, a great recipe always starts with an organized kitchen. It is zero fun to be fumbling around in a grody kitchen while trying to get dinner ready. I actually have a solution for that problem right about here. Great. Now we have the noodle talk. This is possibly the most important pasta discussion you will have all week. The absolute most important thing about lasagna- get the right noodles. Oven ready lasagna is the only logical option here. I cannot think of one single instance where I thought, "Gee! I would really like to triple the work of a normal lasagna by purchasing Non Oven ready noodles!" I do not have that kind of time. Though I tend to never ever make any mistakes at all, I once accidentally grabbed the WRONG noodles. And Lord help us all. All Hell broke loose in my personal kitchen. I was cursing the name of the sadistic human who placed regular lasagna noodles in my clearly predetermined oven ready spot. For those that don't feel as strongly as I about dry pasta selection, the benefit of oven ready lasagna is that you take them straight out of the package and build your lasagna! It saves you a lot of time, a few dishes, and a load of morale. Cool. So now that we have determined what noodles we must use, lets get to the cheese mixture. Oh bless this. The ricotta goodness layered in between noodles and covered in sauce! The ricotta mixture takes the meal from delicious to decadent. Get a medium sized bowl and dump your ricotta in it. The whole tub, don't be scared. Add about 1/2 cup of parmesan cheese, one egg, salt, pepper, and garlic, and a dash of italian seasoning. Stir it up reeaaaal nice. In case you have not noticed...there is a famous spice grouping that I swear by; salt, pepper, and garlic powder. This trio should be in every savory dish you make 100% of the time. Are you at a loss for the spice that makes all food worth eating? it is this. Are you wondering what to season a pork dish with? The trio. Chicken? The trio. Beef? Oh most definitely the trio. It goes on all of the things and makes them all worth eating. I do not apologize for my strong language. If I can get one single person to believe in the power of The Trio, then my life's work is complete. After you step down from your soap box, it is time to make this masterpiece come to life. Let's assemble! You have your handy dandy disposable foil pans, your sauce, noodles, ricotta, and extra cheese. Spoon a thin layer of sauce into the bottom of the pan. Add your noodles. Drop dollops of the ricotta mixture into the middle of the noodles. Now as delicately and beautifully as you can, spread it around. It should feel weird. It won't look pretty. Everything will be fine though, promise. Spoon that sauce over it. Ugh. ANNNND repeat! Until you run out of an ingredient.I mean thats how I do it. Cover that whole pan in one thousand handfuls of mozzarella cheese. Wowza. If you can see an speck of sauce under that cheese, that means add more. Sprinkle your shredded parmesan on top and voila! You now have two beautiful lasagnas. Go ahead and stick one in the oven for dinner tonight. Bake on a foil covered cookie sheet (in case it spills!) at 375 for 60 minutes. I love this set of cookie sheets because they have rimmed edges that catch all the spills before they make a disgusting mess on the bottom of your oven, score! Remove from oven and let it sit as long as you can stand to and then grab a piece of garlic bread and go to literal town on that mother. If you want to have this for dinner tomorrow, simply cover with plastic wrap or foil and refrigerate. If you want to freeze it, cover it in one layer of plastic wrap and two layers of foil. We do not want this delicious masterpiece to get freezer burned! So, that's it! Not so challenging, eh? Please try this amazing dish, your tastebuds will jump up and thank you! Cover the bottom of two foil pans (9x13) in a thin layer of spaghetti sauce. Top with lasagna noodles. Combine ricotta, egg, and spices with 1/4 cup parmesan in a bowl and set aside. Dollop enough ricotta mixture to evenly cover noodles. Cover with a layer of sauce. Repeat for 3-4 layers. Cover final layer with remaining mozzarella and parmesan cheese. Cover tightly with plastic wrap and two layers of foil. Label and freeze. Bake Thawed: Bake lasagna at 375 for 60 minutes. If cheese starts getting too brown, cover lightly with foil until middle is heated through. Our content does not constitute a medical consultation. See a certified medical professional for diagnosis. Home Boss is for informational purposes and should not be considered medical advice, diagnosis or treatment recommendations.